As the mercury starts rising higher outside, it is the time to start working on upping your hairstyle game. Summers are all about being social and active in the immense heat, and you need a hairstyle that helps you do just that but effortlessly. The length of the hair needs to be just right to ensure that you can do all of the work, but your hair continues to look as great as it does. The Summer Hairstyles for Men mostly feature shorter lengths of hair as they are easier to maintain in the sweltering heat of the city. It is also the perfect season to give a spin to your regular hairstyle. So, do not go to your barber and ask him to give you to give the usual haircut. For this season, change things up a bit and make it classy or go full funky. There are no limits to a number of options that you get for the summer hairstyles. The final word in this regard is that no matter what style you try, make sure to keep your scalp free of sweat and dirt in the summer heat. The following fifteen hairstyles should be the answer to your hairstyle searches for this summer. One of the most popular hairstyles of men since time immemorial is the pompadour hairstyle. Add to that the skin fade on both of the sides, and you have in your hand the perfect trendy style that is suited to turn heads anywhere and at any time. You do not need to be a specific hair color to rock this hairstyle, but it is best if you lean towards darker colors of hair. The hairline in front is shaped in an edgy way to complete the look. There is some hairstyle that has been a cult favorite among men of all ages. The swept-back hairstyle is one of those styles. You do not need to have really long hair for this one. Just medium length of hair is good enough to try the look. The extremes of the sides are cut in a skin fade manner. The hair in front is combed backward after the application of ample hair gel. The length of hair shortens from the front towards the back of the head. The blowout haircut started becoming popular during the early 2000’s and still has not lost its charm. The hair looks totally messy and unkempt for this style, but still, it makes you look really handsome. If you have curly hair and you have decided to cut it really short then, go for this look. It is low on maintenance but high on the style quotient. The edges near the forehead are kept cut in an angular manner to bring out the style factor for this look. For all of you blondes out there and for all you who are planning to go blonde for the season, here comes the perfect hairstyle for the sweltering summers. You will look as hot as the temperatures outside with this hairstyle. If you suffer from the thinness of hair, this cut is the ideal solution as the texture that is added by the cutting of hair in layers makes it look more voluminous than it actually is. Sweep it all towards the front, and you are ready for the day. This one is for all the dark or brunette-haired hunks out there. If you feel that you do not have too much time to perfect that hairstyle in the morning, then this look will feel like a savior to you. It is easy and breezy to achieve in the minimum amount of time needed. All you need is a good stylist to do the skin fade cut on the sides. The hair in the middle of the head needs to get kept really long. Apply hair gel and take a thick-teethed comb to sweep it backward. Wavy hair is truly a blessing for a man for the sheer reason that there are so many options to style it. If you are a wavy-haired man looking for a new style to try out for the summers, then your search ends right here and right now. You do not need to keep the height of the quiff sky-high, and you can choose whichever height you want your hair to be. Just keep it messy and casually swept back. There is taper fading cut on the sides. Loads of men out there do not want to keep their hair long during the summers. They feel that with the temperatures rising outside, long hair will be too much to handle for them. This style of short hair is just what they need to try out for the summers. It is just rightly textured to avoid making it look boring and regular. The best part is that this hairstyle is supremely versatile. From shirts, tee shirts to blazers, you can try it with anything. If you are someone who is heavily into hair experiments and just hates playing it safe, this look will definitely catch your eye. It can be tried on any hair color, but it looks the edgiest on the jet-black color of hair. The hair is completely cropped off from the back and the sides while the central portion of hair is kept at a medium length. Comb it all towards the front, and that is it for the look. Now, it is the right time to make those heads turn at the parties you attend this season. It is another hairstyle for the dark-haired lookers who like to keep it short and stylish for the summers. Though the hair is kept short overall, it is kept longer in the middle than the rest of the hair. Comb this longer portion of hair to sweep it to either right or left side. Which side to sweep it to depend upon your choice of what looks good on yourself. The hair is a little puffed up at the center. The undercut hairstyle is something that needs no explanation to most me. They have tried it and loved it for the longest time. What this hairstyle does differently is sweeping the hair to any one side among the right or left according to your wish. The hairstyle is tailor-made for the brunettes amongst you. You can take the style quotient in this one a notch higher by adding some caramel highlights. Wear a nice white tee-shirt and flaunt this hairstyle. You will definitely be the talk of the party. Receding hairstyle is definitely something of a worry for most men as they feel that it is the end of the hairstyle game for them. But that is completely not true as even the shortest of hair and fading hair cannot stop you if you have the love for fashion inherent in you. Take a look at this style and you will believe that there are hairstyles for all types of hair. The cropping of hair really short will prevent the extreme loss of hair that you suffer from while giving you an easy hairstyle. At a time when one of the most common complaints is that of rapid hair loss, having thick hair is rare kind of possession. You do not just need to take care of the possession but it is also important that you style it right. The hair is kept at medium to long length for this one. The next step is using your hands to mess it up to bring that casual look. The summers are mostly about comfy tees and this style is perfect for that. 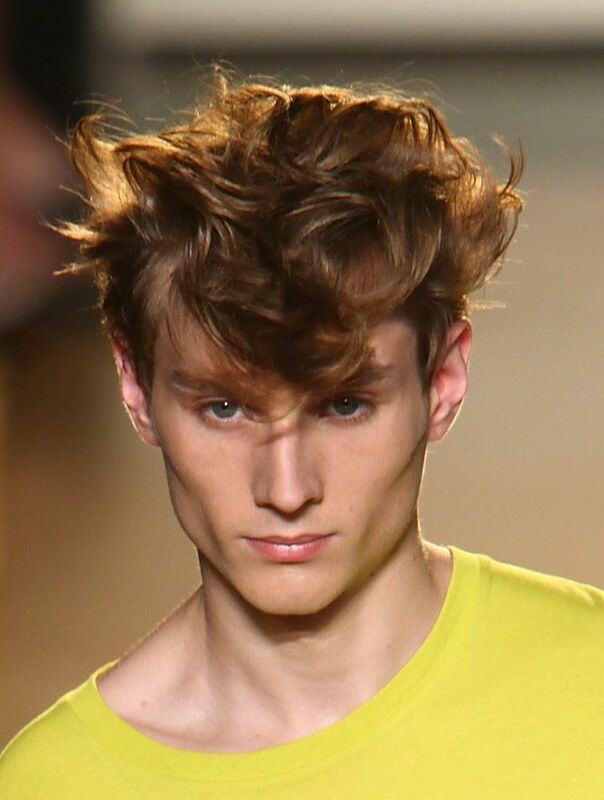 It does not get messier than this hairstyle. It is the perfect reflection of the very popular bed-head trend of hair. It will help if you have wavy texture of hair for this look. You can otherwise make waves by taking the help of your stylist. Just sweep it towards the front to cover your forehead after you have the whole hair unkempt and unruly. The ideal look for the beach party is right here to be given a shot. This style has been getting a lot of attention from men in the recent times and is one of the trendiest hairstyles that you can try for the hot summers. Ask your hairstylist to cut your hair really short with skin fading on the ends of both sides. Now comb the hair towards front. In your busy schedule, you will hardly need a minute to complete the style which is a major USP of this hairstyle. The casual and fun is the vibe that you get from this hairstyle. It is the right kind of cool that you need during the summers. The hair is cut short for this one and then combed towards the front. The only major thing that you need to keep in mind is that the hair should not be swept towards the front in a very neatly combed manner. It is supposed to stay a bit carefully unkempt for the look.